Explores the connections between spirituality and social action. Helpfully presented in two parts, "Theoretical Foundations" and "Social Gospel in Practice." Contains vital advice and models to help congregations mobilize for justice work. See the free online study guide. This is not a how to save the world book, but a challenge to mind and conscience in the context of a church community. We have perhaps learned that true fulfillment has to do with both personal meaning and social responsibility. The two do not compete; they re-enforce one another. We are in the process of learning that church social action is not a small band of marginal activists in the church decrying church inaction or seeking to represent the whole church. Rather, it is a congregational process of coming to terms with the mission of the religious community in a society that sometimes confuses the separation of church and state with the divorce of religion and public policy. That is a good place to be – in the continuing tension of piety and prophecy, spirituality and society, individual and community. It is through this tension that we will work out our common destiny. As we face a very “unbrave new world,” it is imperative that Unitarian Universalists take seriously the prophetic tradition that has been so central to our history and faith. “If you care about the future of progressive religion, if you seek to revive its impact on society, then you have opened the right book. The faith expounded here is humanistic, inclusive, and prophetic. Richard Gilbert is no mere theoretician. He is, and has been throughout an exemplary ministry of more than thirty years, a practitioner of the faith he advocates: publicly engaged religious leadership, seeking to help create what Dr. King called ‘the Beloved Community’ for us all. “By demonstrating that spirituality and social action are inseparable, Richard Gilbert challenges us to live our lives, as individuals and in congregations, in order "to both grow a soul and repair the world." 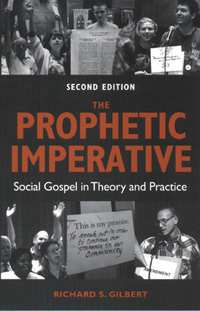 Richard describes the four roles any congregation can take toward society – social service, witness, education, action – and then walks us through each by providing a thorough and powerful review of the historical, theological, and sociological roots of a Unitarian Univeralist prophetic imperative.